Measurements: 2.8 x 4.6 inches, or 70 x 116 mm. Back of card: Divided into 4 rectangles, alternating blue & green. In the center, a red wheel with 16 spokes. May be inverted. Book included: Yes, illustrated, 239 pages, 5.9 x 9 inches, or 15 x 23 cm. The book is priced at $14.95, but is not shown in the current Llewellyn catalog. If you need the book by itself, contact the publishers directly. Comments: From the back of the box we read that Raymond Buckland was brought up by English Romani Gypsies. There are, actually, quite a few Romani in England, a fact that might surprise you. 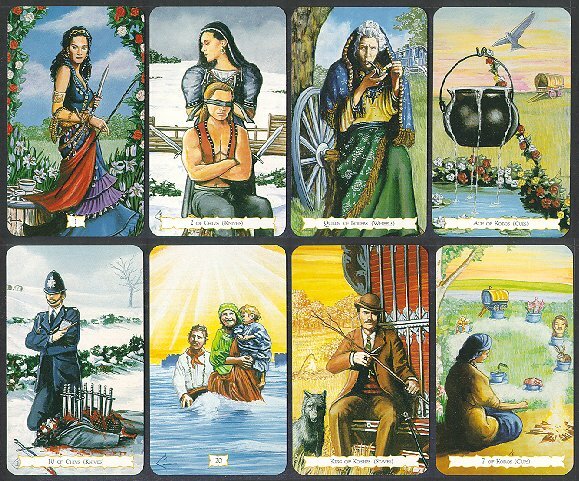 Buckland has written dozens of books on gypsies & witchcraft, this is his first tarot deck. Son of a full-blooded Romani, he is proud of his heritage, he makes liberal use of the Romani language in the book. The book includes English to Romani & Romani to English word lists. Major arcana have only a small number on the bottom to identify them. Many books on the tarot are so obscure and complex that they end up discouraging everyone but the advanced practitioner. In contrast, here is a book that is written in simple language, that makes reading and studying the tarot a joy." An occult rule states that when someone says he's being clear & direct, he is actually being obscure & difficult. So it is here. For each card in this deck, Buckland gives the traditional brief keywords & then follows this with his own, extensive "interpretations". He starts by accurately describing all the various details on the card & then poses a long series of questions to the reader. These questions are misleading by design. With the great detail on each card, this is one of the most secretive decks I have ever seen. A lot of something is screaming out from this deck, but without a Romani background, we do not know what.